ORES models are ready. We should deploy the filters. See https://labels.wmflabs.org/stats/itwiki/18 for those who labeled the most edits to train ORES. These contributors will be most likely to be interested in helping us announce the new filters. We've worked with @Rotpunkt in the past to improve ORES for itwiki so he might be interested in helping out. Halfak added a subscriber: Rotpunkt. I've scheduled the above patch for deployment on Thursday February 14 at 00:00-01:00 UTC (Wednesday 16:00-17:00). 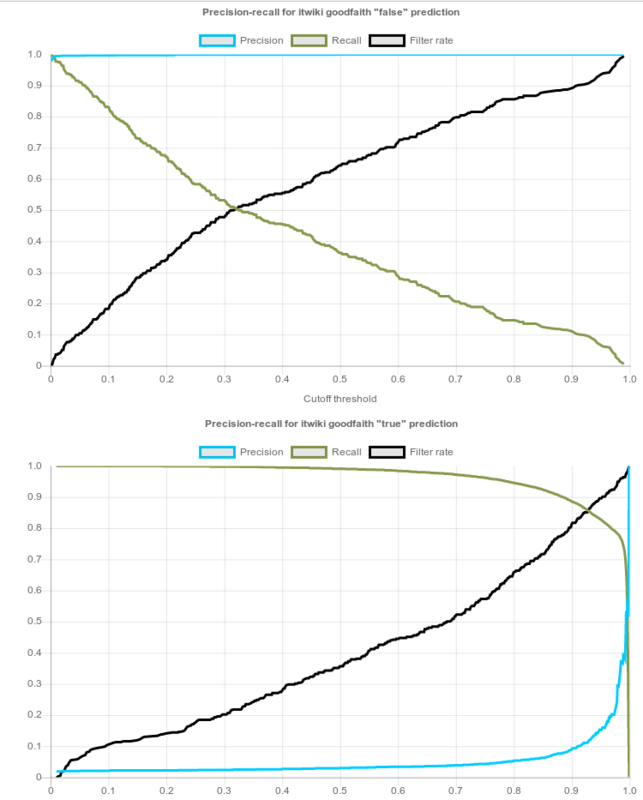 Since the vast majority of edits are good faith, you'd expect the precision line (light blue) to start high and creep up in the true graph (bottom), and for it to climb up from near zero in the false graph (top), but what actually happens is the reverse. The graphs for other wikis' goodfaith models do look as expected (including dewiki, which is also new). I did some analysis to figure out that it is configuration issue. Still we'll need to retrain the model. So that suggests that the labels aren't too crazy. I agree that the graph looks strange. 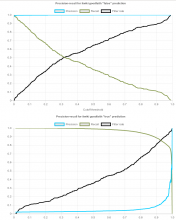 This shows a low threshold, but great fitness statistics (precision = 0.996 @ recall of 0.901). But how could this be true with a match rate of 0.877? Aha! I got it! It looks like the population rates were not specified correctly! Obviously this is backwards and it is messing up the calculations. We'll need to retain this model. I'll have a PR shortly. @Catrope, we can probably get this out in the next deployment -- which could be tomorrow or Thursday. I hope that won't be too disruptive. Thanks for your report and your patience! Halfak moved this task from Active to Review on the Scoring-platform-team (Current) board. Thanks! As long as this only rebuilds itwiki goodfaith, and doesn't touch any of the other models (including itwiki damaging), I can just follow up with a second patch enabling the goodfaith model for RCFilters on itwiki after your deployment. If you do change itwiki's damaging model (or any other wikis' damaging/goodfaith models), then please tell me, because in that case I'd like to look at the updated models before I deploy anything. Thanks to you all, this is great! I'm fully available in case you need any testing/help/whatever on itwiki, just let me know (unfortunately Rotpunkt has retired). Should I write down an announcement for the community, or have you already prepared it? Maybe @Trizek-WMF could point us to texts he used for past announcements. If not, I can draft something. @Halfak thanks, I'm going to translate and publish it. Whoops, I guess I shouldn't close this yet, because goodfaith isn't done yet. In any case, damaging is now live. We're delayed on getting this deployment out the door because of one model we forgot to rebuild. We'll likely have the Italian goodfaith ready early next week. Catrope removed Catrope as the assignee of this task. This looks fine. I understand every choice you made within 3 seconds of looking at it, except for the likelygood level: why did you move it down from 0.995 to 0.99 when the recall figures aren't much different, and this creates overlap with maybebad that wouldn't otherwise exist? I was under the impression an overlap between likelygood and maybebad was desirable. Otherwise there's a small gap: an edit with a score of 0.866 doesn't match any level. We can also just keep the default, which appears to be performing quite well. Overlap between those two is tolerated, but not necessarily desired. We certainly shouldn't go out of our way to engineer one. If this is unclear in my documentation, feel free to suggest edits (or preferably make edits yourself, it's a wiki after all). I'd be in favor of keeping the default for likelygood. [operations/mediawiki-config@master] Reapply "Enable and configure the ORES goodfaith model on itwiki""
Catrope reopened this task as Open. Catrope moved this task from Code Review to QA on the Growth-Team (Current Sprint) board.